Really easy to make soft Flatbread. Just 3 ingredients, no yeast, cooked in 5 minutes. Served with homemade tzatziki and dripping with garlic butter. Cut it in half, both pieces in half again and each piece in half again, so you end up with 8 even pieces. Mix softened butter with the garlic, parsley and sea salt. 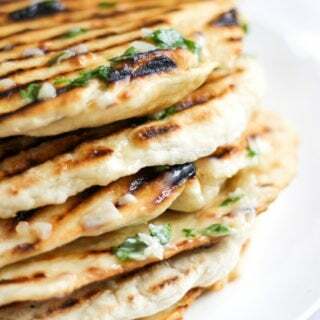 Spread over the flatbreads when you're ready to serve. Mix the yoghurt, grated cucumber, mint and salt well and pop in a bowl to serve as a dip.